December 2015 - Pebbles, Inc. 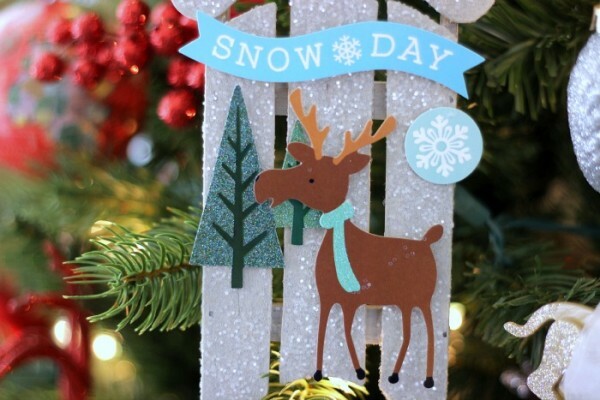 The holidays are nearly over, but winter is bound to stick around for a little while longer. 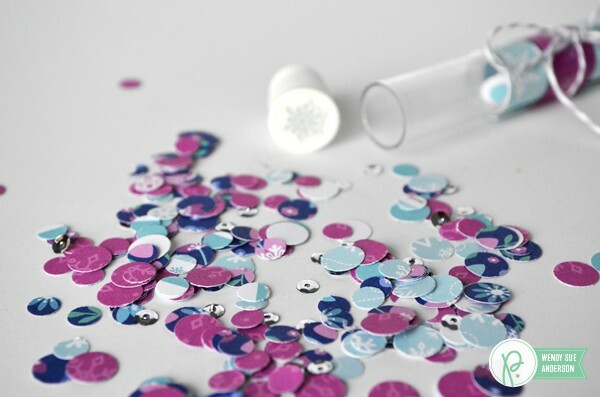 Brighten up those dreary winter days with some happy, sparkly–and easy–home décor. 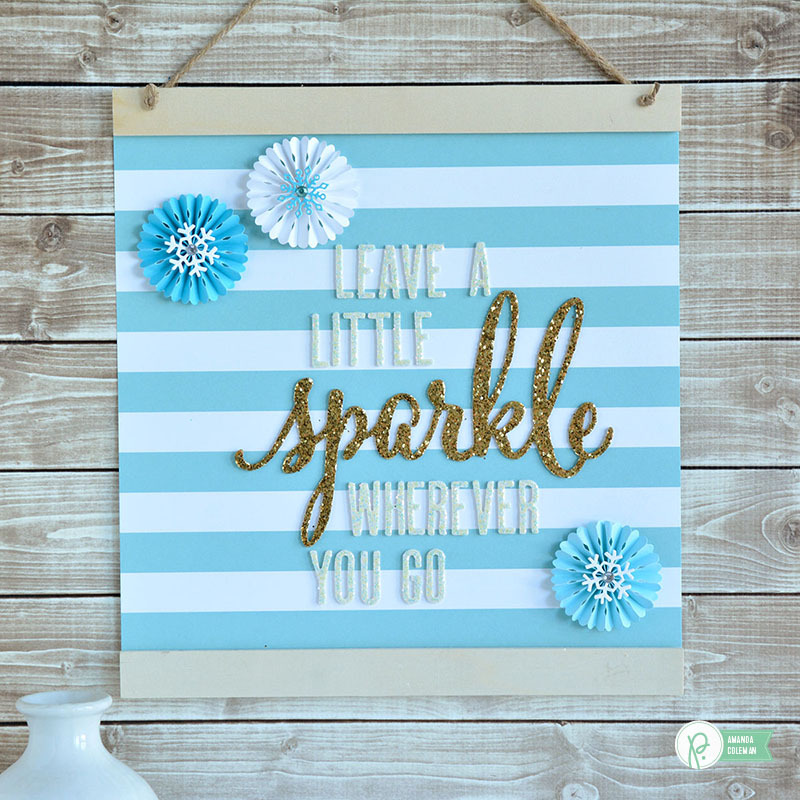 Inspired by a quote on one of the journaling cards in the Winter Wonderland collection, I created an easy 10 minute sparkle wall hanging that will bring a little sparkle into my home this winter. 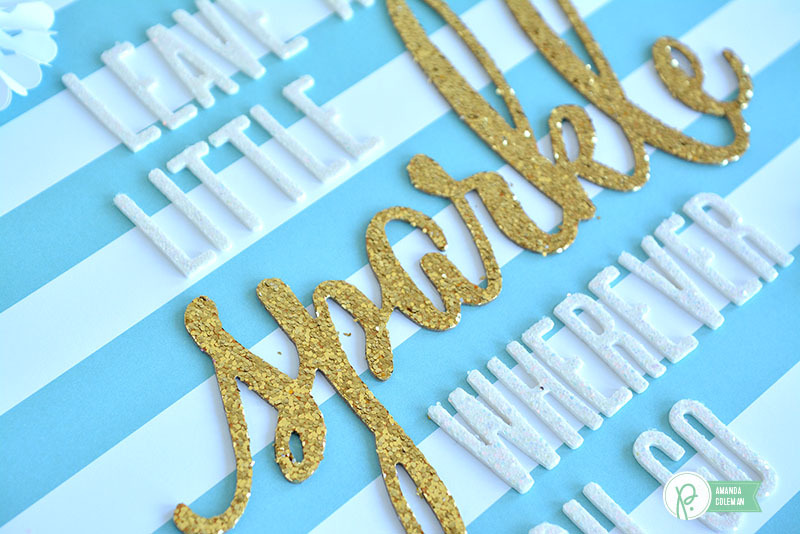 Easy to customize, you can choose your own custom quote that will inspire you. 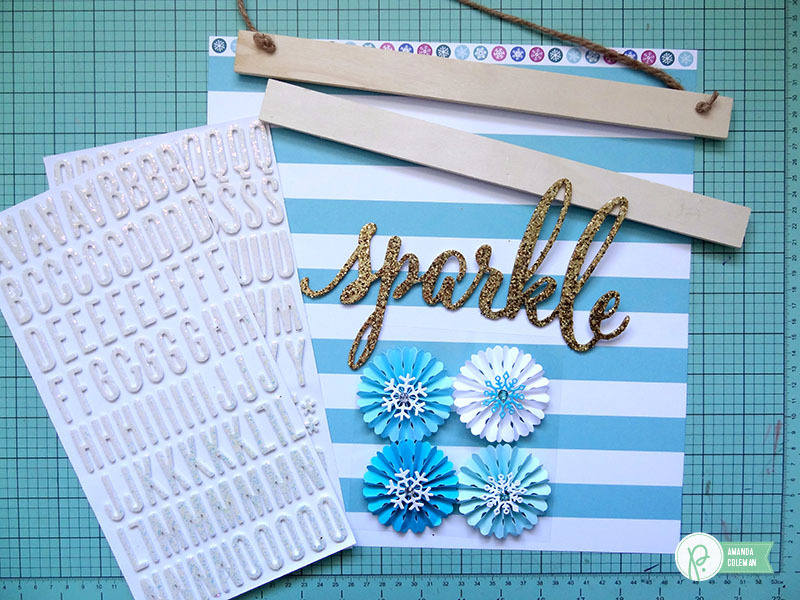 I liked the contrast of the natural wood and gold glitter so I didn’t embellish the poster hanger, but you can decorate the poster hanger like Holly did here. 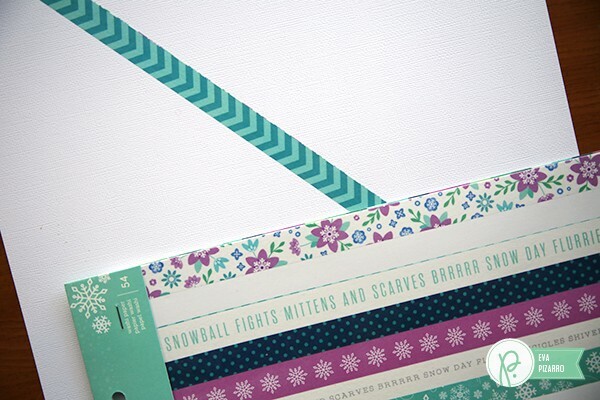 TIP: The poster hanger magnets make it easy to switch out your wall hanging for each season. 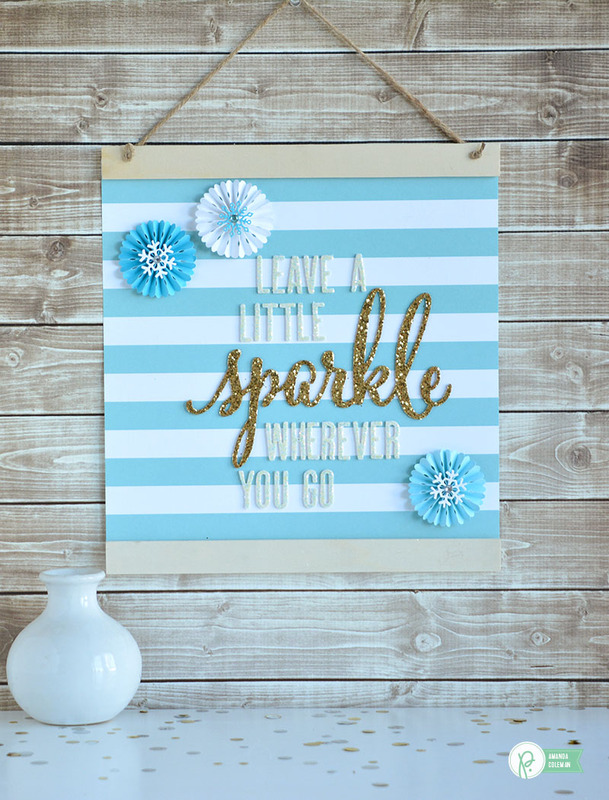 All you need for this 10 minute wall hanging is a sheet of 12″ x 12″ patterned paper, Thickers, a poster hanger, and some embellishments. There are no supplies or special skills required. Your sticker book days from elementary school will come in handy, though. The DIY Home poster hanger makes this project super easy. It fits a 12″ x 12″ piece of paper perfectly. 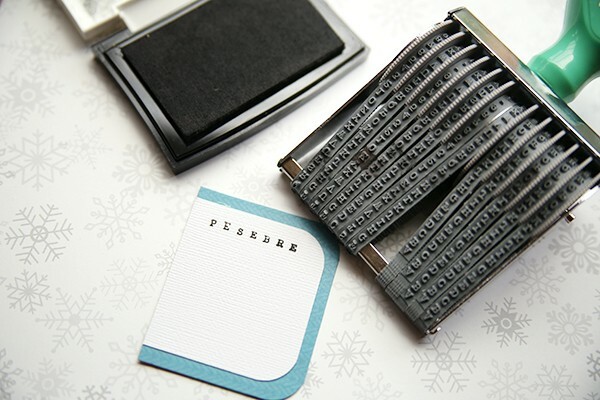 Simply separate the two magnets on the top and bottom pieces and sandwich your paper in between. It is super easy to slide them into place. TIP: If your magnets seem wonky and don’t connect properly, rotate one 180 degrees. 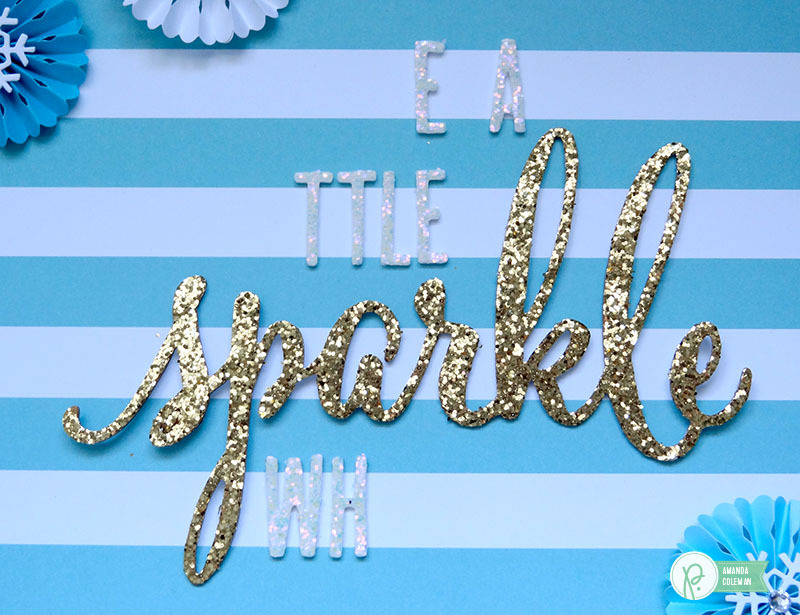 To arrange your Thickers just right, start by placing the gold glittered word on the page, but don’t adhere it just yet. I like to start by affixing the last letter first so I know where my word is going to end. Affix the letters lightly so you can easily rearrange them if needed. 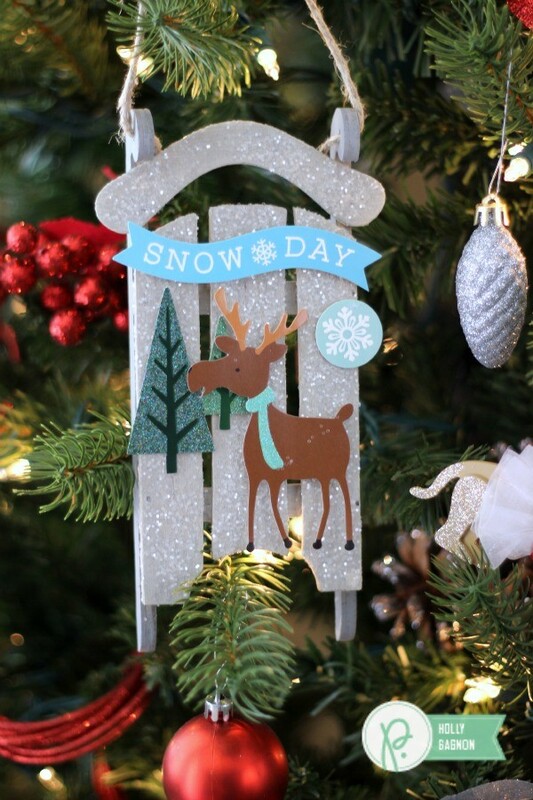 Add some pretty snowflake embellishments and attach the poster hanger and you have an easy 10 minute wall hanging. Have a safe and Happy New Year! 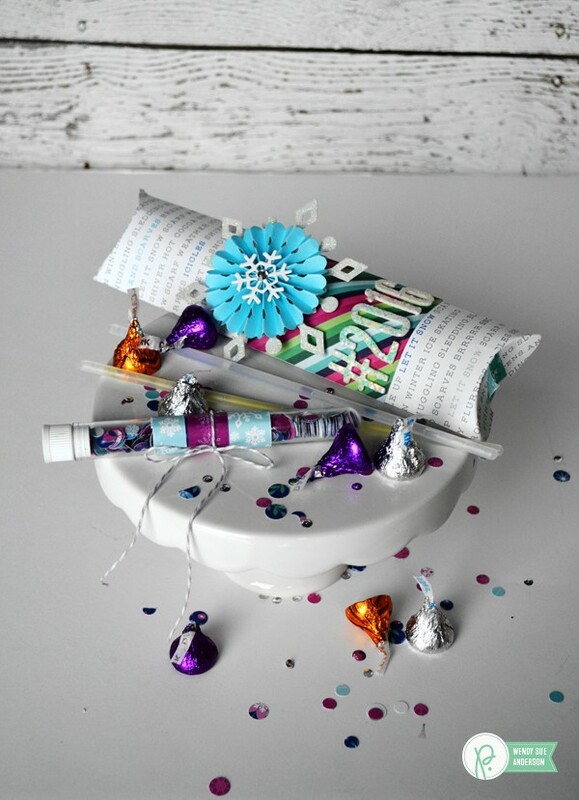 The pillow boxes are quick and easy to put together with the help of this handy-dandy pillow box punch board! 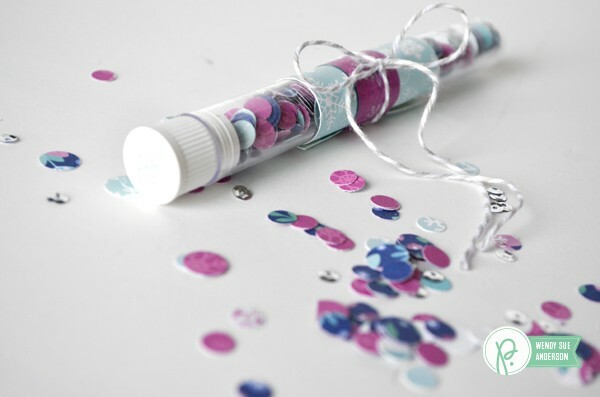 Inside each pillow box I’ve added a fun little tube of confetti! (which will, of course, be thrown OUTSIDE at the stroke of midnight!) 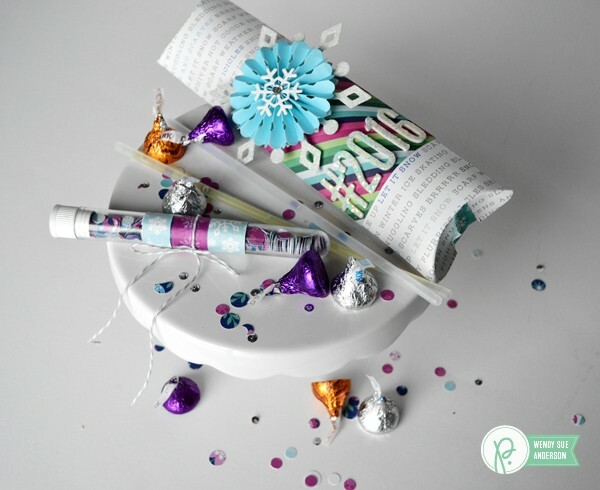 It was quick and easy to make the confetti tubes to coordinate with the gift box. 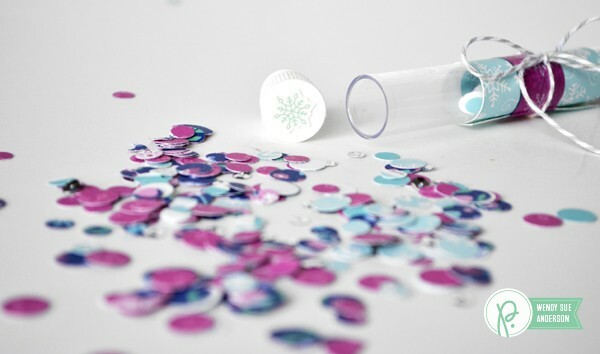 This new confetti punch makes it super simple to punch a bunch of different sized circles at the same time. I added a few sequins for fun. Then I just wrapped a strip of paper, and tied some string, around these little plastic treat tubes. In addition to the confetti, I added some glow sticks, candies, etc. to make the evening special! However you choose to celebrate, I wish you a very Happy New Year!! Hello everyone and Happy Holidays! 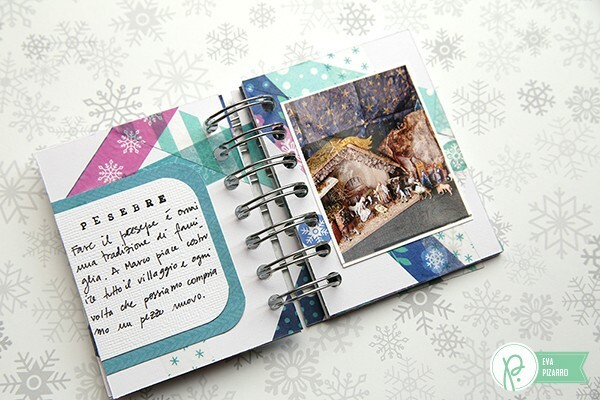 I’m Eva Pizarro and today I want to show you a quick and easy mini album to record all your Christmas memories. I love Christmas and all the little details that makes this season magical. 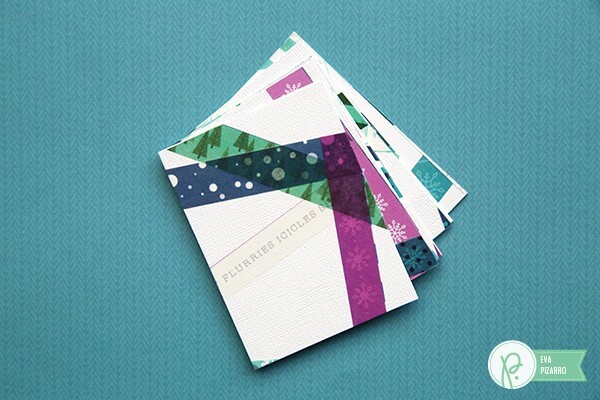 I did this little mini album to record them and because December is always so busy I wanted to keep it simple. 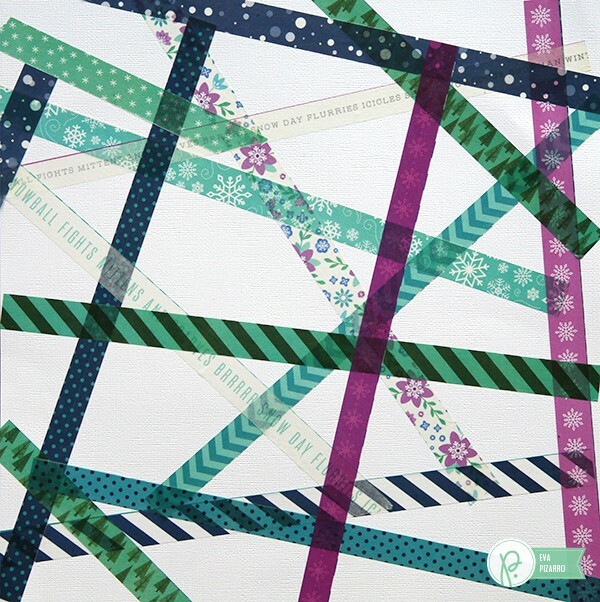 I started with a 12 x 12 inch white paper and covered it with some strips of washi paper. 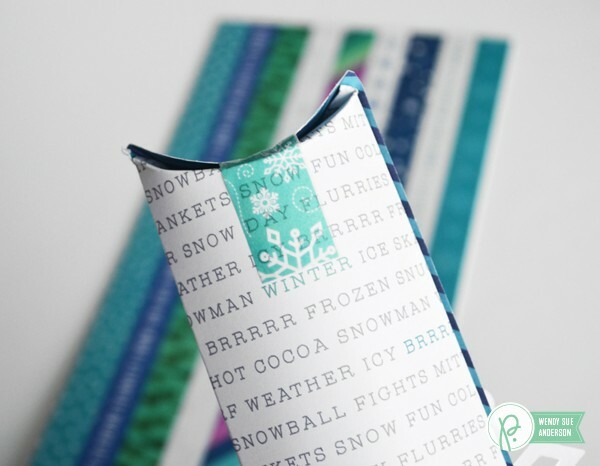 In this package you get 54 strips of paper with very few double designs, it’s a great deal! Cut your mini album pages, I cut mine 3 x 4 inches but you can use any measure you want. 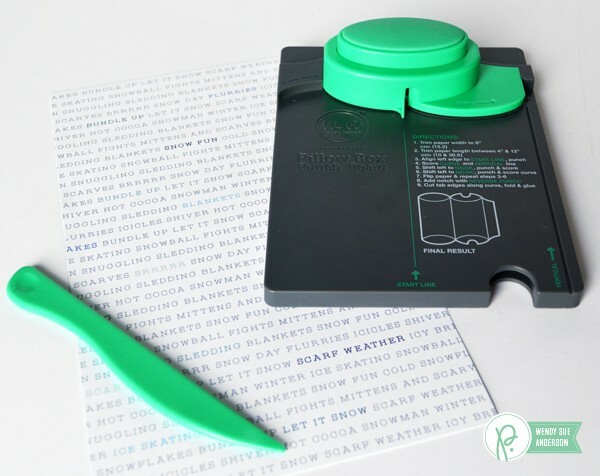 It doesn’t matter if some pages have more or less washi paper, it is supposed to be random! 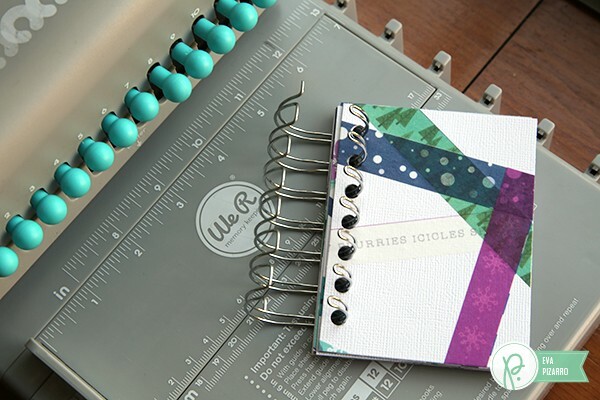 Use your Cinch to bind your mini album. Embellish your front cover. 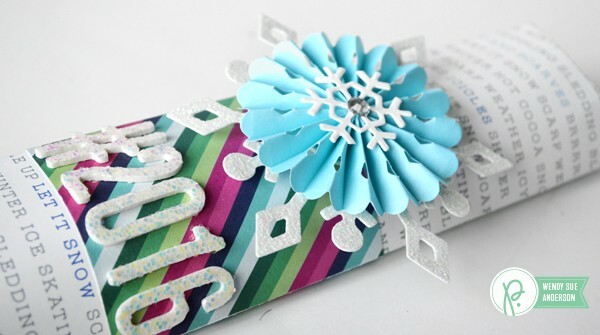 I removed the washi paper strips form the cover and used a Snowflake to decorate it. 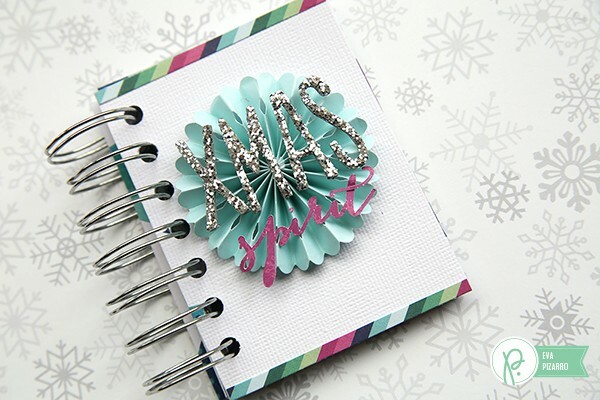 On top of the snowflake I placed my alphas and the word “spirit” that I had previously cut with my electronic die cut machine and some 6 x 6 purple paper. The inside of the mini album is really simple: I made some journaling spots with some white and blu paper and rounded the edges with my Crop a Dile. 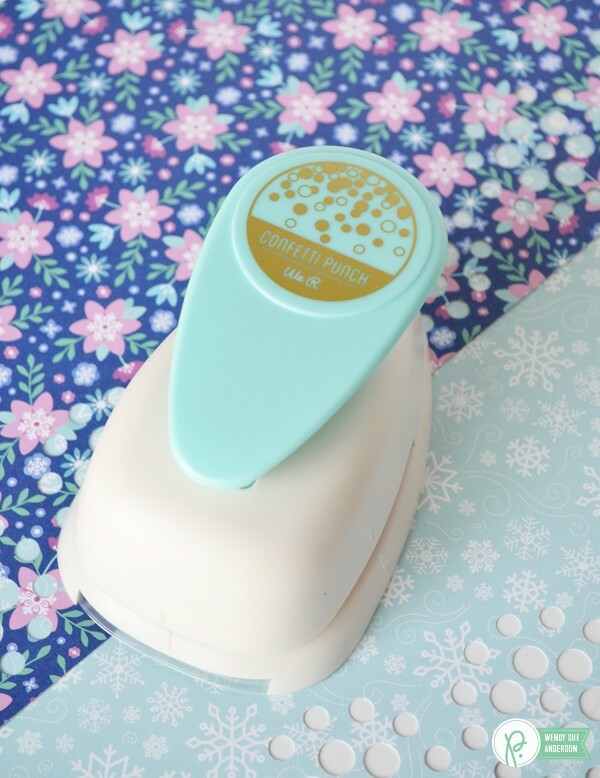 To make the tittle pages I used my big roller stamp form the From Me To You collection. I used one page to place my journaling and in the other one I put a picture. I love the geometric background that you can achieve with the washi paper, and you really don’t need any more embellishments, simple and fast! I hope you have a wonderful holiday today and you can celebrate with someone you love. Merry Christmas! Happy Holiday’s Pebbles Fans! 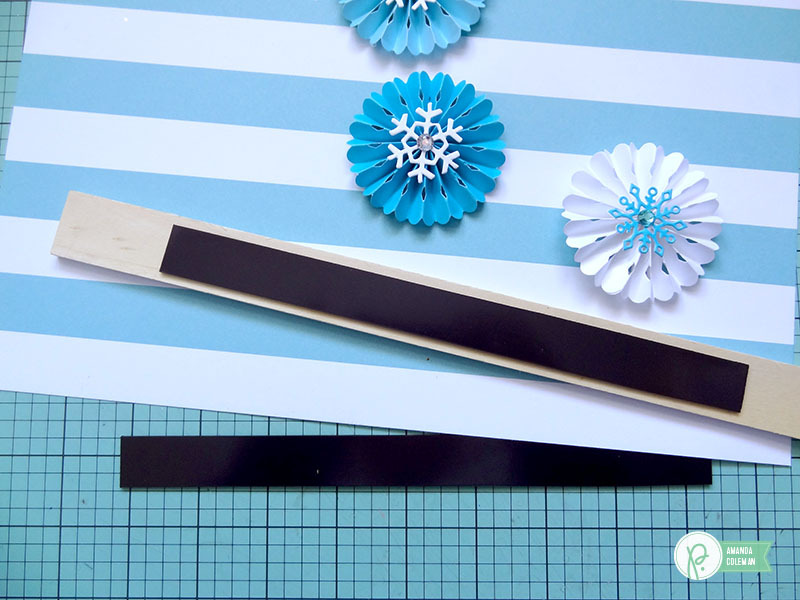 Holly here from Ribbons & Glue sharing with you a DIY Winter Sleigh Ornament made with the beautiful Winter Wonderland collection. I love unique Christmas Ornaments but they can be really expensive. 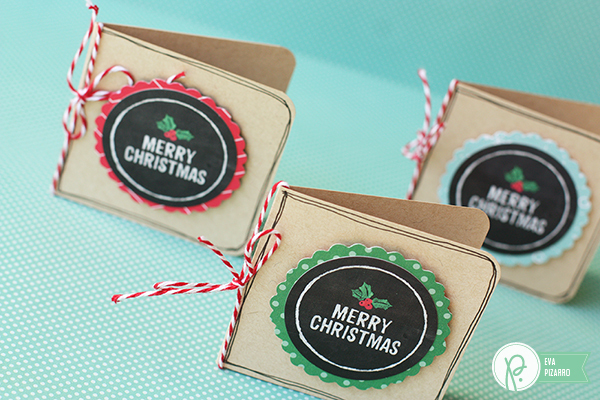 If you’re little creative, it’s a lot of fun to make your own unique, DIY ornaments to coordinate with your holiday decor. Plus, DIY ornaments are easy to make since most craft stores offer lots of options on creating ornaments from glass, wood to ceramic. 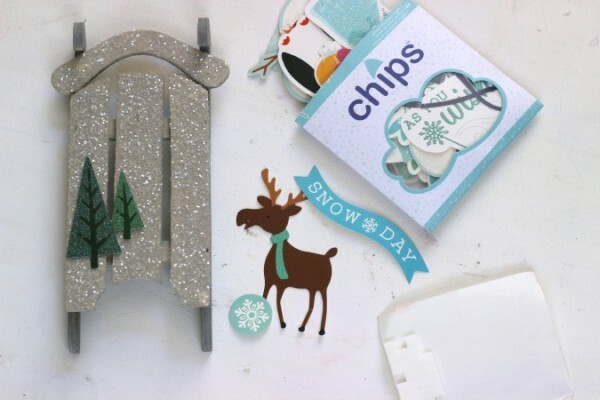 To make this Winter Sleigh Ornament, I painted and glittered a natural wood sleigh gray then adhered Pebbles Winter Wonderland Chipboard shapes on to the front. 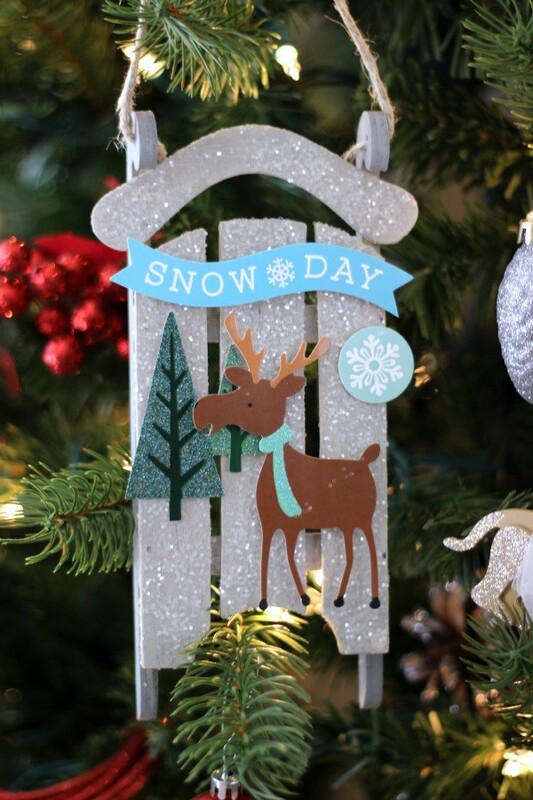 I choose to embellished the sleigh with a woodland creature theme by choosing glittered trees and a cute, festive moose. The Pebbles Inc. Winter Wonderland has many unique shapes and colors to choose from which will make your DIY ornament making easy. Hey Pebbles fans, Becki here. Christmas is only 3 days away! I’m finishing up some last minute details. Are you ready for the big day? 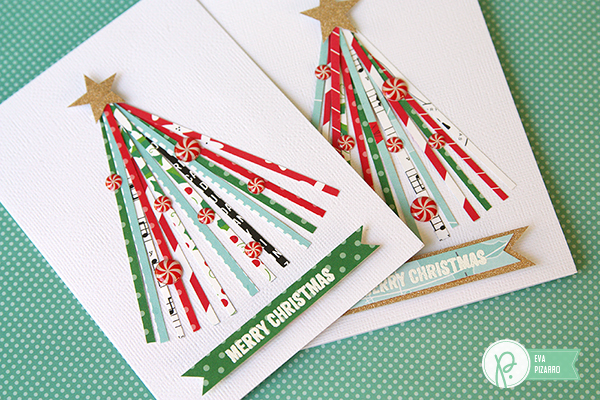 I look forward to sending out Christmas cards every year. Some years I make Christmas cards and some years I have them printed. The one thing that I always do is include a photo. I usually include a family photo or a photo of my kids. 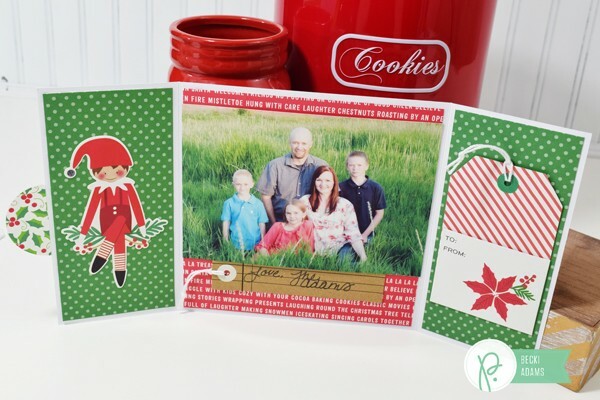 This year I made our Christmas cards and designed them to include our family photo. Today I want to show you 3 cards that I created. Each card is different but they all include a family photo. 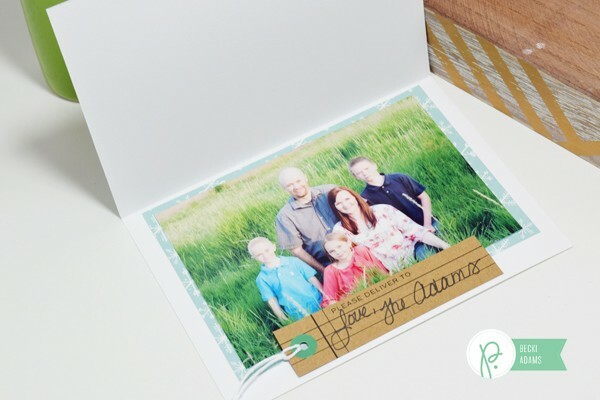 The first card I created has our photo right on the front of the card. This is a 5×7 card. I framed our photo with a 4×6 journaling card. I added the “Merry Christmas” sentiment sticker to the bottom right of the photo. The inside of the card has two 3×4 cards. One has the sentiment, the other is a journaling card. I used this card to hand write a greeting from our family. I love gate fold cards. 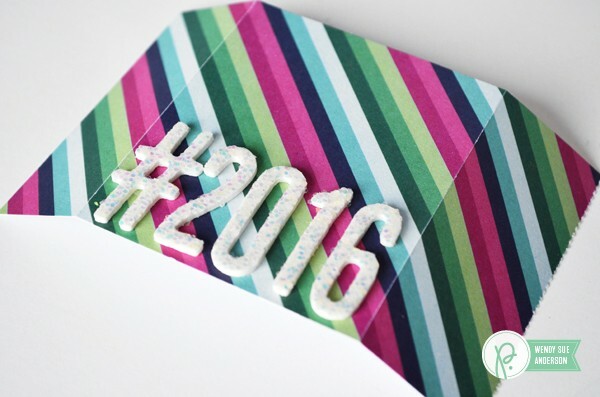 A gate fold card is a card that has 2 flaps that cover the inside of the card. 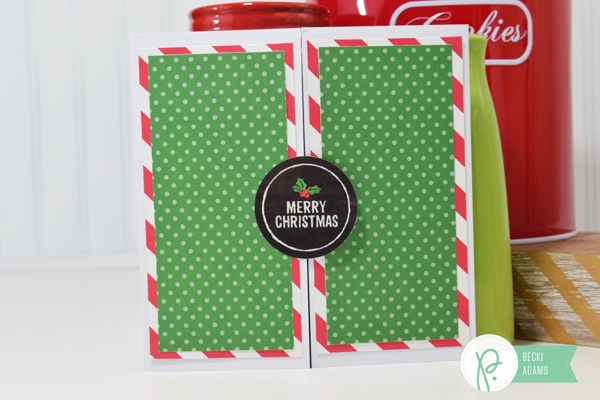 I created a 6×6 gate fold card, covered it in patterned paper and used a “Merry Christmas” sticker as the seal on the card. 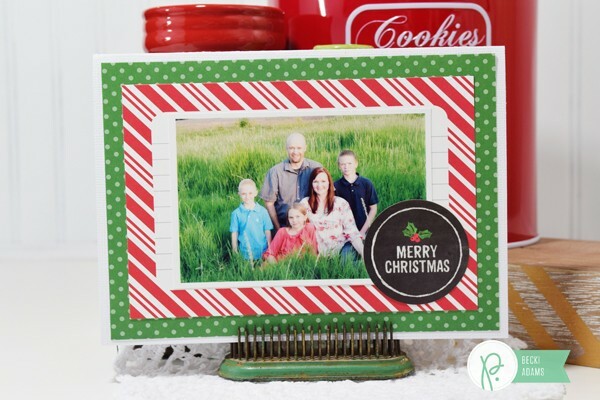 The inside of this card has a few stickers, our family photo, and even a pocket to include more photos or even a gift card. I used the kraft tag that goes inside the tag pocket to write who the card is from. I love adding hand writing to my cards. It gives the card a more personal touch. 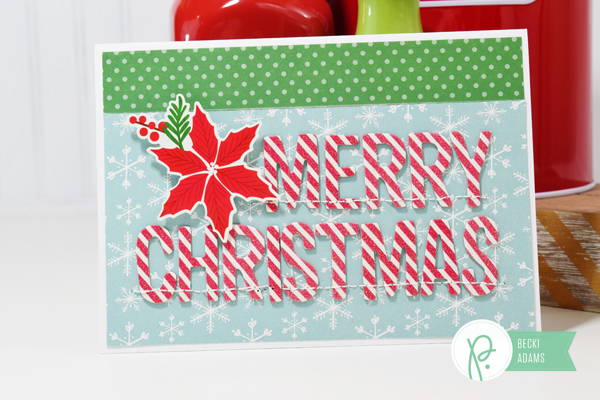 The last card I created has a huge sentiment “Merry Christmas” using candy cane Thickers. I stitched the Thickers onto the front of the card to make sure they stayed in place while in the mail. On the inside of this card I just adhered our family photo and wrote on a kraft tag and adhered it under the photo. 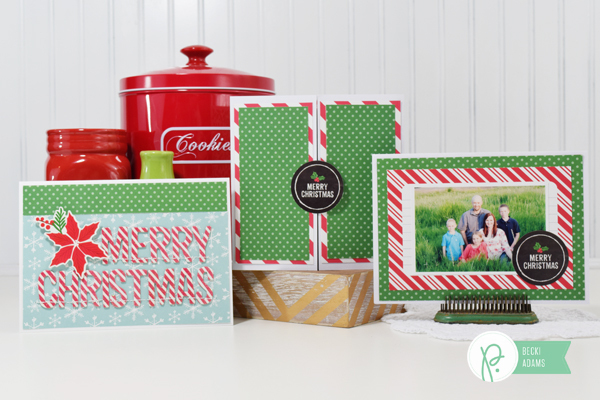 Enjoy the Christmas season and create a few cards that include your family photos. Merry Christmas and Happy New Year! Thank you for visiting us here at Pebbles.